Canada window tint laws are different in each province. 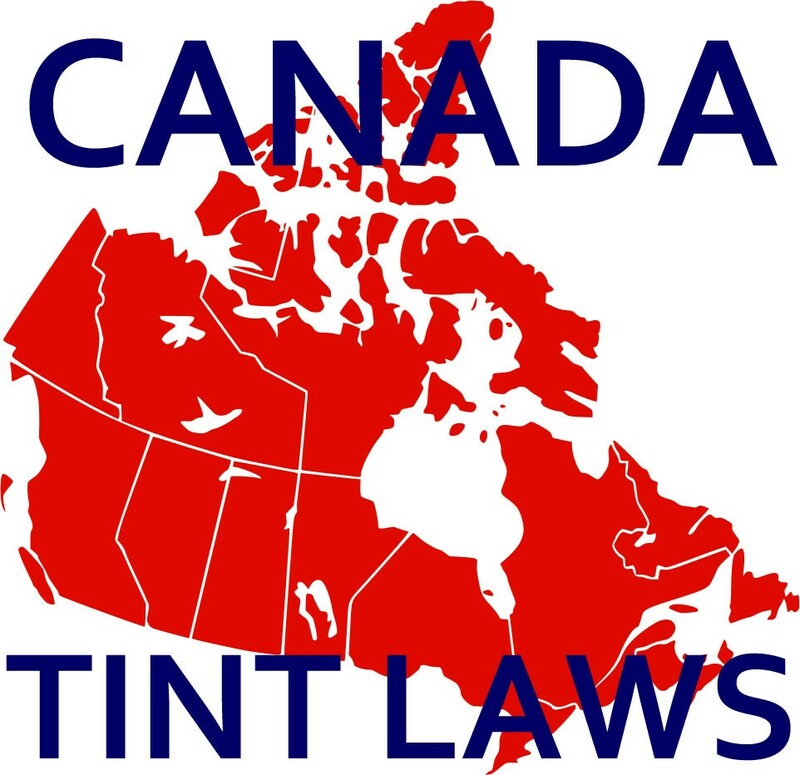 Below we’re providing you with a quick overview of tinting laws, but also more detailed information for each Canadian province. Canada tint laws are different for most provinces. Tinting windshield and front side windows is not allowed in most provinces. Back side windows and rear windshield can have any tint darkness in most of the country. Important note: many websites (including IWFA – International Window Film Association) provide inaccurate or outdated window tinting information! Our data is continuously updated and we include direct links to pertinent and current laws where you can verify all regulations by yourself. We constantly verify data with our Canadian traffic law experts to provide the most accurate and up to date information you can trust. Data is considered current and was last revised on March 4th, 2019. # cm – only specified top centimeters on windshield may be tinted. % – refers to VLT – Visible Light Transmission (lower VLT percentage equals darker tint, for example 30% VLT blocks 70% of light; see example or our tint calculator). 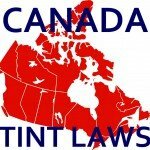 Table above only provides a quick overview of window tint laws in Canada. There are more rules and regulations for each province in CA, therefore we highly recommend reading more details below or clicking on each province name for additional information. Front side windows: No tint allowed. Rear window: Any darkness can be used only if vehicle has both left and right side rearview mirrors. Alberta vehicle equipment laws prohibit installing window tint on the windshield and front side windows. Any level of darkness can be used on back side and rear windows. On windshields only glazing installed by car manufacturer is allowed, as are clear non-tinted frost shields or window stickers which do not impair the driver’s vision. Side mirrors: Mandatory if rear window is tinted. Source: Alberta Vehicle Equipment Regulation, Section 69 – Window glazing (.pdf file, scroll to page 35). Windshield: Top 75mm (3 inches) may be tinted. Rear window: Any darkness can be used only if vehicle has both left and right side rear view mirrors. In British Columbia you are allowed to tint only the top portion of the windshield up to 7.5 centimeters. Front side windows may not be tinted, but any level of darkness can be used on windows behind the driver. Rear window can be tinted with any level of darkness, however in that case in BC and the most of Canada your vehicle must have exterior rear view mirrors. Note: installing clear UV filter film is not prohibited and does not require special medical exemptions (source). Source: British Columbia Motor Vehicle Act Regulations, Division 7 – Other Equipment, section 7.05 – Windshields and windows. Windshield: Top 127mm (5 inches) may be tinted with no less than 25% VLT. Front side windows: Must have over 50% VLT (blocks less than 50% of total light). Back side windows: Must have 35% VLT or more (blocks 65% of light or less). Rear window: Any darkness can be used in case the vehicle has both left and right outside rear view mirrors. In Manitoba you are allowed to tint only the top portion of the windshield up to 12.7 centimeters, exactly 5 inches. If the tint is in a uniform shade (same darkness over the whole 5″ area) the tint may not block more than 75% of light. In case of a gradual gradient light transmission may not be reduced below 5% in top 64mm, and 25% in the area between 64mm and 127mm from the top of the windshield. Front side windows may be tinted but must pass through 50% or more light. Light reflection on front passenger windows may not be over 35%. Back side windows may not block more than 65% or light. In case back side windows block over 50% of light you must use dual external rear view mirrors, which isn’t the case in other provinces. Rear window may not block more than 30% of light. However if any tint is applied Manitoba as well as the rest of Canada requires your vehicle to have exterior rear view mirrors on left and right side. Manitoba window tint laws also permit a 5% variance when testing windows with a light transmission meter device. Our Manitoba tint laws are always up to date! We noticed many other websites and even local tinting businesses have inaccurate information, so please be careful and verify it yourself. Reflective tint: Maximum of 35% for front and back side windows, no reflection permitted on windshield and rear window. Side mirrors: Mandatory if rear side windows block over 50% of light. Source: Consolidated Regulations of Manitoba, The Highway Traffic Act (C.C.S.M. c. H60): Vehicle Equipment, Safety and Inspection Regulation, Part 3: Prohibited and Restricted Equipment, Other Equipment – Tinted windows (direct link, .PDF file, see page 72 – Tinted windows 3.22(1), mirror link; , last retrieved March 2019). Windshield: 70% VLT tint is permitted (blocks no more than 30% of total light). Front side windows: 70% VLT tint is permitted. In New Brunswick you are allowed to tint your entire windshield but your window film must block less than 30% of light. Front side windows may also be tinted with same light transmission level. You can use any level of darkness on your back side windows and rear window. In New Brunswick the law does not specifically require external rear view mirrors (“side wings”), whereas in most of Canada’s provinces these are required. Fine for illegally tinted windows in New Brunswick is $172.50 or more. Source: New Brunswick Motor Vehicle Act (Chapter M-17; Miscellaneous Equipment; scroll to section 238) – current since March 2019. Front side windows: No tint permitted. Rear window: Any darkness can be used only. Newfoundland vehicle equipment laws prohibit installing window tint on the windshield and front side windows that does not conform with Motor Vehicle Safety Act. This Act may technically allow up to 70% VLT (block no more than 30% of light), but we do not recommend tinting front side windows or windshields. Back side and rear windows do not have any tinting restrictions. Furthermore Newfoundland and Labrador laws allow clear non-tinted frost shields or window stickers which do not impair the driver’s vision. Newfoundland & Labrador law does not specifically require external rear view mirrors, however in most of Canada’s provinces these are required if rear window is glazed with tinting film. Penalties for unlawful car tint involve a fine of $23 – $52, but you may also incur additional costs. Source: Consolidated Newfoundland and Labrador Regulation (Highway Traffic Act, Licensing and Equipment Regulations, 38. Window Glazing). Windshield: No window tint allowed. Front side windows: No window tint allowed. Northwest Territories Motor Vehicle Act prohibits using any sunscreen material on windshield and passenger front side windows. Laws in NWT province do not specifically restrict tinting back side windows nor the rear window, therefore based on other regulations our interpretation is that any car tint darkness is permitted. Reflective tint: No specific restrictions for back side and rear windows, not advisable. Side mirrors: No specific requirements, recommended. Source: Northwest Territories Motor Vehicle Equipment Regulations (Motor Vehicle Act) – .pdf file, 117kb, see section 58 on page 17; mirror link – last retrieved March 2019. Windshield: No window tint permitted. Front side windows: No window tint permitted. In Nova Scotia you may not use any tint on windshield and front side passenger windows. NS law does not restrict tinting back side windows nor the rear window, therefore our interpretation is that all tint darkness levels are permitted. Reflective tint: No specific restrictions, not advisable. Side mirrors: No specific requirements. Violating Nova Scotia vehicle equipment laws and having unlawful car window tint typically results in a fine of $109 – $227. You will also receive an order to have it removed, and not complying with it can result in another $595 fine. Source: Nova Scotia Motor Vehicle Act, Standards of Vehicle Equipment Regulations (Section 200). Nunavut Motor Vehicle Equipment Regulations prohibit the use of any sunscreen material on windshield and passenger front side windows. Nunavut law does not restrict tinting back side windows nor the rear window, therefore our interpretation is that any car tint darkness is permitted. Source: Nunavut Consolidation of Motor Vehicles Act (.pdf file, 351kb, see section 141: Obstruction of view by windshield stickers on page 84; mirror link, retrieved March 2019). Front side windows: No tint recommended. Back side windows: Any tint darkness can be used. Rear window: Any tint darkness can be used. We strongly suggest not installing window tint on windshield or front side windows, as any percentage could technically result in a fine. It is up to each individual police officer to determine whether your tint “substantially” obscures vision in your car. New Ontario vehicle inspection regulations state that vehicles manufactured after January 1st, 2017 may not have any aftermarket window tint applied to the windshield. OEM (Original Equipment Manufacturer) or factory-made cars can have 70% VLT (30% opacity/light block), and tinting may not extend more than 75mm from top of windshield. Ontario law does not restrict tinting and darkness on your back side windows and rear window. Ontario’s traffic law also requires having left and right external rear view mirrors in case rear window is tinted (sec. 74.2). Those of you who research Ontario window tint laws elsewhere please ensure you are reading up to date content. Ontario amended tinting laws in July 2016, and new regulations are in effect since January 1st, 2017. Our information is up to date, but please keep in mind many other unofficial sources still provide inaccurate and unlawful information! Trust but verify! Side mirrors: Required if rear window is tinted. Penalties for unlawful car window tint in Ontario result in a $85 – $500 fine, and there may be additional surcharges and fees involved. Sources: Ontario Highway Traffic Act, R.S.O. 1990, CHAPTER H.8, Equipment obstructing view (see sections 73 and 74); Ontario Vehicle Inspection Standard (.pdf file, 865kb, scroll to page 76; mirror link, last retrieved March 2019). Rear window: Any darkness can be used when car has left and right side rear view mirrors. On Prince Edward Island you are not permitted to install any aftermarket window tint on the windshield nor on front side windows. Prince Edward Island laws only allow clear non-tinted frost shields or window stickers which do not impair the driver’s vision. There are no tinting restrictions and any level of darkness can be used on back side windows. You can use any tint percentage on your rear window as well, however in that case your car must have left and right exterior rear view mirrors. Source: Prince Edward Island Highway Traffic Act, Part V: Equipment, Miscellaneous Equipment, 138. Window Glazing, front and side (.pdf file, 3MB, scroll to section 138 on page 72; mirror link, last retrieved March 2019). Windshield: Top 15cm (6 inches) may be tinted. Front side windows: Must have over 70% VLT (blocks less than 30% of light in). In Quebec you are allowed to tint only the top portion of the windshield up to 15 centimeters. Front side windows may be tinted but must pass through 70% or more light. There are no tinting restrictions and any level of darkness can be used on back side windows. You can use any tint percentage on your rear window as well, however in that case in Quebec and most other provinces in Canada your vehicle must have exterior rear view mirrors. In Saskatchewan you are not permitted to install any aftermarket window tint on the windshield nor on front side windows. There are no window tinting restrictions and any level of darkness can be used on back side windows and rear window. Side mirrors: Always required on non-vintage vehicles. Penalty for violating Saskatchewan vehicle equipment regulations results in a $115 – $150 fine. Source: Saskatchewan Vehicle Equipment Regulations (.pdf file, 485kb, see section 64 and 66 on page 40 and 41; alternate link; – last retrieved March 2019). Back side windows: No tint recommended*. Rear window: No tint recommended*. * Tinting windows behind driver may be legal, however due to ambiguous Yukon laws we do not advise it. Yukon province has no relevant regulations which specifically permit or restrict window tinting. Only relevant regulations concerning vehicle windows relate to obscured windows (Motor Vehicles Act section 190), where no person shall drive a vehicle if the view is obscured in any way to make driving hazardous or dangerous. This section may be interpreted differently depending on each individual police officer, therefore we do not recommend tinting car windows in Yukon. Penalties for violating obscured windshield regulations is punishable by a fine up to $500. We recommend contacting your local law enforcement and getting information from them first-hand, preferably in writing. Feel free to contact us with any additional info if you are able to provide, thank you! Side mirrors: Dual exterior side mirrors required if view of rear window is obstructed or interfered with in any manner. Source: Equipment Regulations in Motor Vehicles Act of Yukon Consolidated Acts (sec. 24 – Windshield, and sec. 22 – Rear view mirror); Yukon Motor Vehicles Act (.pdf file, 2MB, see Part 12: Obscured Windshield, section 190 on page 169; alternate link – last retrieved March 2019). Penalties for illegal window tint vary for each province, but you can typically expect a $100 fine if caught by the police. You may also be required to remove your tint incurring additional costs, and not complying can incur additional costs at around $600 range. In some cases your vehicle may even get taken off the road and require an additional inspection before you can legally drive it again. In Quebec for example if a police officer pulls you over and issues a notice for inspection you will be required to visit a road vehicle inspection agent. Failure to inspect your vehicle makes you liable for a $438 to $865 fine. In case the inspection agent determines your car windows are tinted beyond legal limits you will be required to remove illegal tint within 48 hours. Failure to do so will make your vehicle unauthorized for driving and you will be liable for a $154 to $274 fine each time you fail to comply. In addition you will be required to store your car at your own expense until a photometric reading certifies that your windows are up to standards. Some newer factory-made vehicles already come with tinted windows, and Canada Motor Vehicle Safety Act permits those vehicles to have as much as 70% VLT (maximum of 30% light transmission block). This does not mean aftermarket window tint is legal; it only means this level of tint is permitted if the vehicle was manufactured as such. Canada’s Motor Vehicle Safety Act applies to all provinces, so if your vehicle manufacturer installed darkened windows they are legal in the entire country regardless of local province laws. Legal window tint in most of Canada? Residents who often travel between provinces or even car owners looking to sell their vehicles some day may consider installing car tint which is legal in majority of Canada’s provinces. Windshield: Don’t apply any tint whatsoever. Side windows: Don’t apply any tint. Back side windows: 35% VLT or more. Rear window: 30% VLT or more. Excluding Manitoba laws, you could apply any tint % on back side and rear window. We also did not include Yukon regulations as it is very vague and any percentage could potentially be unlawful. In Canada car window tint is regulated by Motor Vehicle Safety Act as well as laws for specific provinces. Windshield and front passenger windows are illegal to tint in almost all provinces, and we strongly advise against it. Furthermore tint darkness when measured includes both factory and aftermarket tint, so ensure you don’t go overboard with darkness if your vehicle’s windows are manufactured with tinted glass. Penalties can be harsh and police officers in Canada are not forgiving about illegal window tint. Even in provinces where light transmission percentage isn’t clearly defined officers can still issue notices and fines if they determine they don’t have a clear vision of the driver. Canada regulations don’t take into account residency, and even in case your car window tint is legal in your province you can still get a citation in other Canadian provinces. While in other provinces you are subject to their laws, meaning you should always ensure your window tint levels are legally permitted in most of the country. Take another closer look at our Province laws comparison table for quick info about each province, and see Legal tint % in Canada section of this article to find out what level of tint darkness is permitted in most of the country. Our information about Canada Window Tint Laws was last updated and verified in 2018 and 2019. Our articles are constantly checked for accuracy by our partnered Canadian traffic law experts, but in case any of our info provided is not up to date or correct be sure to contact us so we can fix it. Thanks!